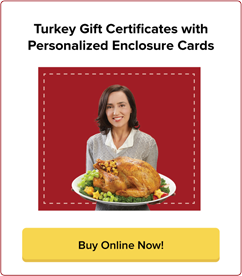 Grocery Gift Certificates & Vouchers | Employee Gifts | gThankYou! Everyone loves the gift of groceries! gThankYou! Grocery Gift Certificates are a popular employee gift for the holidays allowing recipients to choose their holiday meal, as well as a fun and valued anytime gift for employee and customer appreciation. Share your thanks with a practical gift that will delight everyone. Good for food items only – Any brands, any preparation. Redeem at virtually any US grocery store. Your company/organization name printed on Certificates. Free! FREE Enclosure Cards with your custom message and company logo (If desired). What are gThankYou! Grocery Gift Certificates? gThankYou! Grocery Gift Certificates are Manufacturer Coupons that can be redeemed for any food items at virtually all major grocery chains in the U.S.
Like all gThankYou Gift Certificates, our vouchers for groceries are just like the cents-off coupons everyone redeems at supermarket checkouts. Watch our two-minute video at left to see why gThankYou is America’s Favorite Employee Gift Certificate. What can Grocery Gift Certificates be redeemed for? Is anything excluded? A gThankYou! Grocery Gift Certificate can be redeemed for any brands and any variety of food products — fresh, frozen, shelf-stable, or cooked. Our Grocery Certificates exclude all non-food items such as tobacco, alcohol and pharmaceuticals. Whether your gift of groceries is for a holiday meal or a thoughtful “anytime gift,” recipients will love the flexibility to choose what they want, at their favorite grocery store. It’s a gift that’s always valued and appreciated. Inspire your recipients’ meal planning: download our FREE cookbooks for perfecting a delicious meal at the holidays or anytime. Our free cookbooks make great bonus gifts to your gift of groceries. What stores honor gThankYou! Gift Certificates? All gThankYou! Gift Certificates can be redeemed at any major grocery chain that accepts Manufacturer Coupons in the United States. The only stores that do not honor gThankYou Gift Certificates are stores that do not honor any Manufacturer Coupons, such as Sam’s, Costco, specialty stores such as HoneyBaked Ham, and the Aldi chain. For a useful one-page guide to redeeming gThankYou Gift Certificates and more, click here: “How to Redeem Your gThankYou Gift Certificate”. We offer English and Spanish versions of our “How to” guide. It’s perfect for including with your gift and sharing with managers and supervisors. What do gThankYou! Grocery Gift Certificates look like? We ship virtually all orders the same day, so you can receive your Certificates as fast as the next business day! Let us know what shipping speed you need — ground, two-day or next-day — and we will ensure your order arrives when you want. 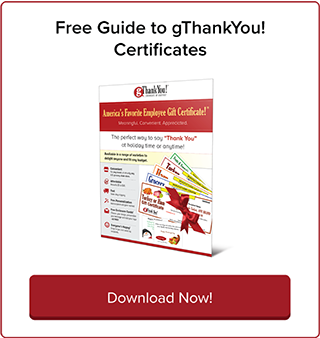 Ordering gThankYou Certificates is easy! Order directly online and call us at 888-484-1658 with any questions. If you’re ordering for a large company with a distributed workforce, call us at 888-484-1658 so we can confirm an ordering and delivery schedule that works for you. We’re happy to help you meet your timing! There are no minimums for ordering any gThankYou gift vouchers — you can order as few as one! What are the free Enclosure Cards and how do I order them? gThankYou Enclosure Cards are 3-inches high by 4-inches wide (3″ x 4″) cardstock cards and come in a variety of seasonal and everyday designs. Add your custom message, plus your company logo if you wish, and we include them free with your order of gThankYou Gift Certificates. Choose from dozens of designs to fit any holiday, season or occasion. Ordering is as easy as choosing the design and personalization you prefer. During the checkout process we'll ask you if you would like the free cards - click yes! Once your purchase is complete, we send you a link to order your free cards. Tell us the design you want, give us your message and upload your logo. We create a proof of your card design, and once you approve it, send the free cards with your Grocery Gift Certificate order. Smile! We do all this and still ship same day. Enclosure Cards are the perfect addition to your gifts of appreciation. Gifts are always better with a message of gratitude, so don’t miss the opportunity to add a heartfelt “Thank You” note to your gift. Writing a holiday message to employees? Be inspired! Download our popular guide. "Put the 'Thanks' in Thanksgiving: How to Write a Thanksgiving Letter to Employees" for examples of and insights from real workplace holiday letters to employees. How are Grocery Gift Certificates different than Grocery Gift Cards? gThankYou! Grocery Gift Certificates are Manufacturer Coupons redeemable only for food products; they explicitly prohibit all non-food items such as tobacco products, alcoholic beverages and prescriptions. They have an expiration date and provide no cash or residual value. gThankYou! Grocery Gift Certificates can be redeemed anywhere in the U.S. at all major grocery stores that honor Manufacturer Coupons. Grocery or Store Gift Cards can only be used in one specific store chain. And, most gift cards are redeemable for any merchandise in the store, whether it’s liquor, general merchandise or food. 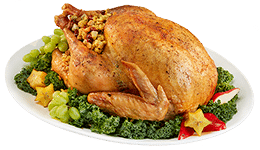 Companies looking to provide a holiday food gift for employees and customers choose gThankYou because our Certificates are Manufacturer Coupons. If you are concerned with the tax implications of employee gift-giving, please consult with your accounting or tax professional. Why is the gift of groceries a great employee gift? Employee gift-giving is important for successful workplace recognition. Research shows that companies that recognize employees regularly throughout the year for small wins — as opposed to once-a-year recognition — have happier, more confident, productive, creative and loyal employees. gThankYou! Grocery Gift Certificates are a practical, affordable and meaningful gift that can be shared anytime. Everyone needs groceries! By giving vouchers for groceries, you’re sharing in a meaningful part of your employees’ lives and even inspiring healthy choices. Grocery Gift Certificates make great on-the-spot reward and workplace wellness incentives, too. For additional insights into effective employee gift-giving, download our free eBook, “The Ultimate Guide to Employee Gift-Giving” and share it with your management team! Choose from a variety of our popular food Gift Certificates perfect for workplace holiday gifts, anytime appreciation, wellness incentives and customer promotions. You select the variety and value that best fits your objectives and budget!